TL;DR: Enhanced risk of severe weather today, with the greatest threats being damaging straight-line winds and a few tornados are possible. Estimated arrival time between 8pm and midnight, give or take a couple of hours. There is lots of uncertainty with this event. We are expecting a strong line of storms to move through late tonight ahead of a cold front. This line of storms could be strong to severe. The Storm Prediction Center has placed us in the Enhanced category for severe weather, which is a 3 on a scale of 0-5, with 5 being the highest severe weather category. The greatest threat tonight is damaging straight-line winds of 58mph or greater. 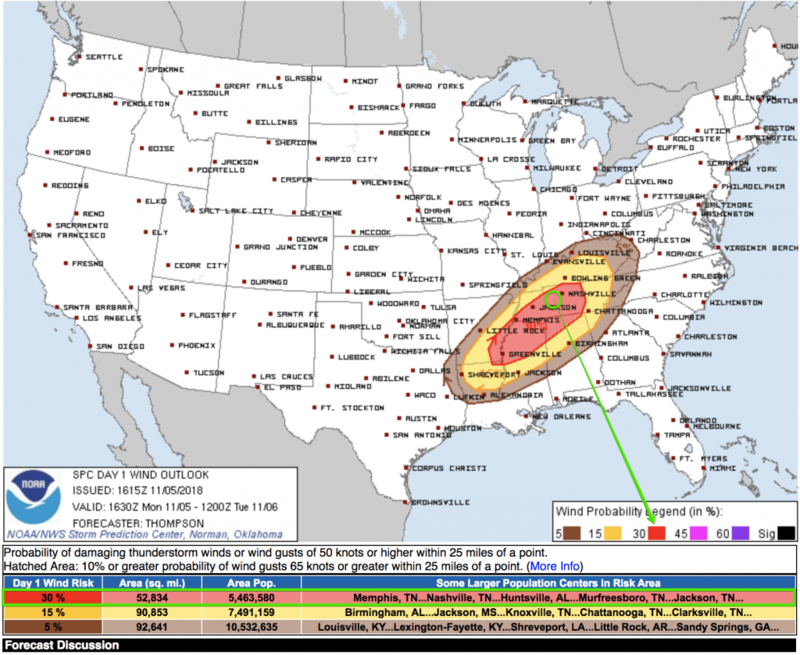 The SPC gives us a 30% chance of seeing damaging winds within 25 miles of a point. This also means a 70% chance of NOT seeing damaging straight-line winds within 25 miles of a point (more on that below). You can see the wind risks below, where we are firmly in the red area (30%). The next threat is a few tornadoes are possible. The SPC has us outlined in a 10% chance of seeing a tornado within 25 miles of a point (yellow area below), with a 10% or greater chance of seeing an EF2 or larger tornado within 25 miles of a point (the black circle with hatch marks below). This also means we have a 90% chance of NOT seeing a tornado and if we do see a tornado, we have a 90% chance of it NOT being an EF2 or larger tornado (again, more on that below). The next threat is the potential for isolated flash flooding. The storms could carry with it very heavy rain that could cause some flooding in flood-prone areas. This particular event won’t have much instability to work with, so the hail threat is limited. I would be surprised to see any storm have the potential to produce hail 1 inch or greater in size (more on this below). The current timing for the line of storms will be 8pm to midnight for Dickson County, give or take a couple of hours. As the day moves on, we’ll be able to shrink that window down a bit in timing. Lots of uncertainty with this event. I can’t stress enough that with any severe weather event, there are things that could go “wrong” that limit the potential for severe weather. Some events are less likely that things go “wrong,” while others are more likely to see things go “wrong.” Today is one of those days we could see more things go “wrong” than “right.” If you’re not a fan of severe weather, you want things to go “wrong” (hence all the quotes). CAPE is convective available potential energy, or storm fuel (instability). We need some CAPE or instability in the atmosphere for the storms to feed off of to grow and strengthen into troublemakers. The typical threshold for seeing severe weather from CAPE is when CAPE reaches 1000 j/kg (1000 is good enough to know for this discussion). We have, however, seen severe weather and even tornados when CAPE is anywhere from 500 to 1000. Current weather models are hinting at the possibility that there won’t be much CAPE here for the storms to work off of when the line gets here. The HRRR model, which is our short-range, rapid refresh model (updated every hour) shows CAPE possibly peaking at around 350 j/kg, way less than that average 1000 j/kg needed to see storms get going. The NAM3 model, a medium range model updated every 6 hours, shows CAPE at about 150 j/kg a bit before the storms get here. One caveat to the CAPE number is that there could be enough moisture in the atmosphere that it could override CAPE. Moisture is measured in dew points. Anything above 60 degree in dew points is favorable to see storms. The HRRR model is indicating we could see mid 60-degree dew points (63-67). The NAM3 is also in agreeance with the amount of moisture we could see ahead of the line. 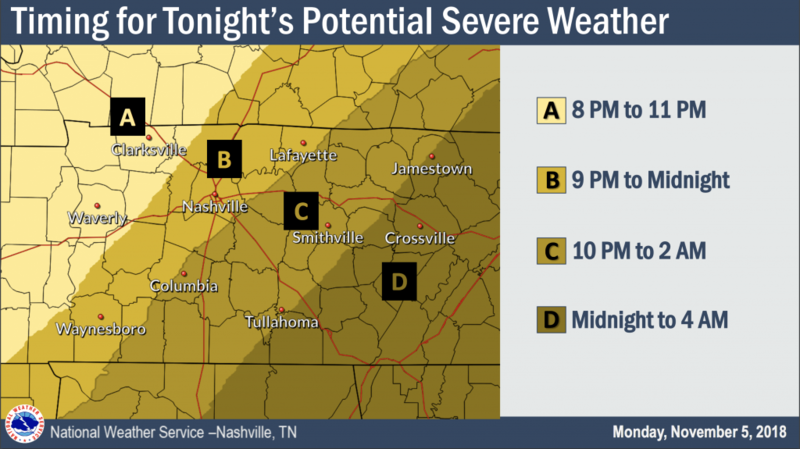 The following graphic courtesy of @NashSevereWx. The wind shear with this storm system is impressively strong. Wind shear is the change in speed and/or direction of the wind with height. In today’s case, winds on the ground will be coming out of the south at a decent speed, but as you go up through the atmosphere, the direction changes where the wind is coming out of the west at even a faster speed than on the ground. This change in direction is what makes storms rotate and produce tornados, which is why there is a tornado risk today. However, wind shear can work against itself too. The winds are expected to be moving so fast above our heads that it could essentially “chop off” the tops of storms that try to build. If it manages to cut the tops off of the storms, the storms will essentially have to try to rebuild, thus limiting their ability to grow inhibited. There is a good possibility that any storms that grow and build could be cut off and limited due to the very same wind shear that got it going in the first place. Finally, rain before the line. Finally, the potential to see rain before the line of storms gets here could also limit our chances of seeing severe weather. If it happens to rain a bit over a decent enough area before the main line of storms arrives, then it will make the line of storms that come in less severe. The reason this could limit our severe weather potential is that the convection ahead of the storm (rain) will basically eat up all of the storm fuel (CAPE) before the main line gets here, leaving nothing but crumbs for the main line. However, while last night’s model runs were indicating this as a possibility, this morning it looks to be slightly less likely that we could see some rain before the main line of storms come in, so our main focus will be if we can get enough CAPE in here or not for the storms to feed off of. There are a few factors (outlined above) that could keep our severe weather chances limited (which of course is a good thing). Unlike other events where there wasn’t much we could see that could “bust” an event, this one has a few different things that could cause it to “bust” (again, outlined above). This is why when I gave the SPC probabilities above, I also gave them in terms of what could *NOT* happen as well, because, with any storm system, there is always a greater chance of you not seeing any severe weather than there is a chance of you seeing severe weather. 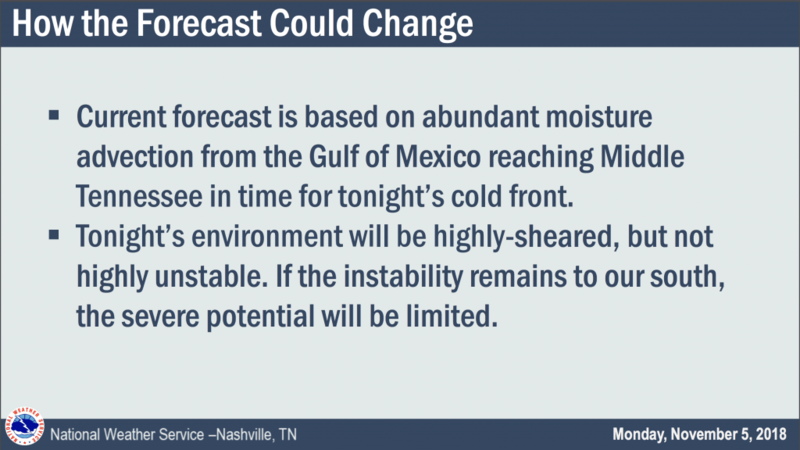 …but you should still be prepared anyways because there is still the potential for severe weather. Any time where there is a forecast of severe weather, it should be taken seriously, regardless if there are factors working against it or not. The environment could change in a matter of an hour or two and we can go from having next to no severe weather to a major severe weather outbreak. It’s always best to be prepared and discover you didn’t have to take shelter than to not be prepared and don’t know what to do should you have a warning issued for your area. 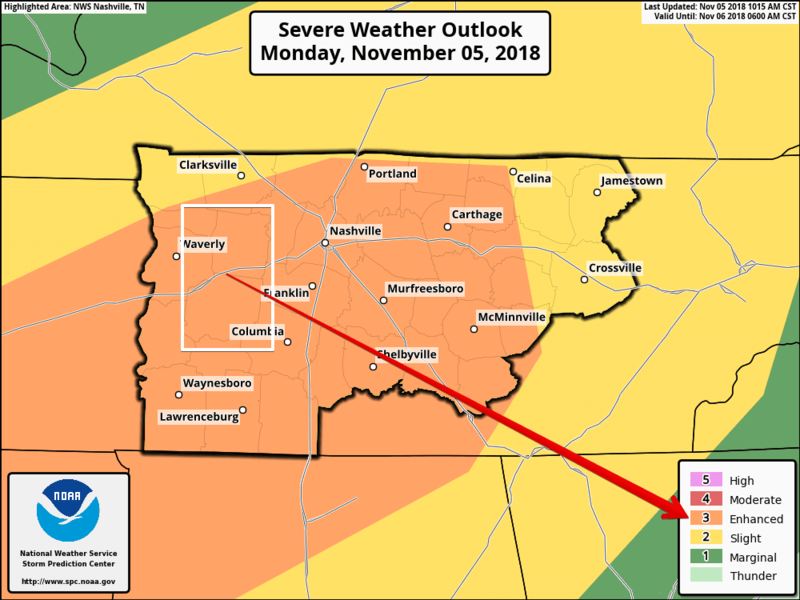 Take the precautions and be prepared now for tonight’s severe weather potential, especially if you’ll be sleeping when the storms are expected to arrive. To read more about how to prepare for a severe weather event and what you need to do to keep you and your family safe, you can read here: When Severe Weather is Forecasted. Of course I’ll be tweeting away on Twitter at @DicksonSevereWx. You don’t have to have a Twitter account to see my tweets, but it’s recommended, especially when we start looking for severe weather reports. I will not be posting to Facebook any warnings due to Facebook’s algorithm.